For years a lot of plastic packaging in our household came from a range of dairy products. In addition to the staples of milk, cheese and butter there were pots of yoghurts, crème fraiche, soured cream, double cream, cream cheese, soya milk, goats milk products, dips, individually wrapped cheeses for school lunches, spreadable Lurpak and margarine for baking. There was a vague sense of a lot of packaging and things going past their best-by-date, but I’m not sure it ever fully surfaced into my consciousness as wasteful. My focus was on catering for everyone’s tastes and preferences and having everything available, all of the time. It all sounds a bit mad to me now. I now put the emphasis on non-plastic packaging and local availability and that’s it. Milk is delivered by the milk man and unpackaged cheese is bought straight from a local cheesemaker or the farmers market – and boy, is it delicious! I also learned how to make non-dairy milk such as oat and almond milk which is easy and inexpensive. When Waitrose recently stopped wrapping their butter in paper, it forced me to go out looking for an alternative. I realised that there are three local producers of butter wrapped in paper. I keep the butter in the fridge and portion it into a lovely Cornish butter dish on the counter which keeps the butter just the right side of soft for easy spreading on toast and sandwiches. 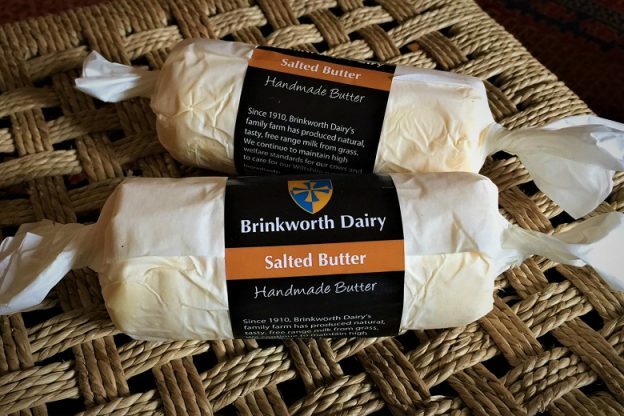 I would prefer to buy butter unpackaged as I have learned (from a reader commenting below) that the paper butter is wrapped in is usually impregnated with microcrystalline wax or other petroleum products. The same is true for the packaging of an excellent Breton cream cheese I buy and have many excellent uses for, such as spreading on toast, making dips, adding to soups, making carbonara sauce and more. The pots look like they are just cardboard with a little silver foil to cover the cheese. It is still better than a plastic tub, but it is just as well to know that things that look like cardboard, like Tetra Pak for example, are not all that innocent. You can buy little glass jars of clotted cream in some farm shops, but again, you have plastic inside the lid and the glued on labels are printed in polymer colours and ‘gold’. A dairy shop near me that also does milk refills in glass bottles will take orders for cream in glass jars. It means phoning ahead and picking up. It makes double cream a rare and special commodity in our household but maybe that’s ok! For those eating a lot yoghurt, making your own is probably a really good discipline. You can buy yoghurt making kits and build it into your daily routine. There is a recipe for yoghurt and for making crème fraiche in the comments from readers below. But if none of this appeals to you and you have no sources of unpackaged food where you live, then consider cutting down on the number of products you use and simplify so you can save on plastic packaging and avoid food waste. This entry was posted in Food shopping, Recipes and tagged dairy products unpackaged, non-plastic packaging, unpackaged food, zero plastic on April 27, 2018 by admin. Are you someone who prefers an alternative to dairy milk? Perhaps you are lactose intolerant, a vegan, or you just don’t like cows milk? There are lots of alternatives in the shops – all of which seem to come in drinks cartons, usually Tetra Pak, as far as I can tell. They can contain a lot of sugar and additives and in any case, Tetra Pak is not an option when you want to avoid single-use plastic. 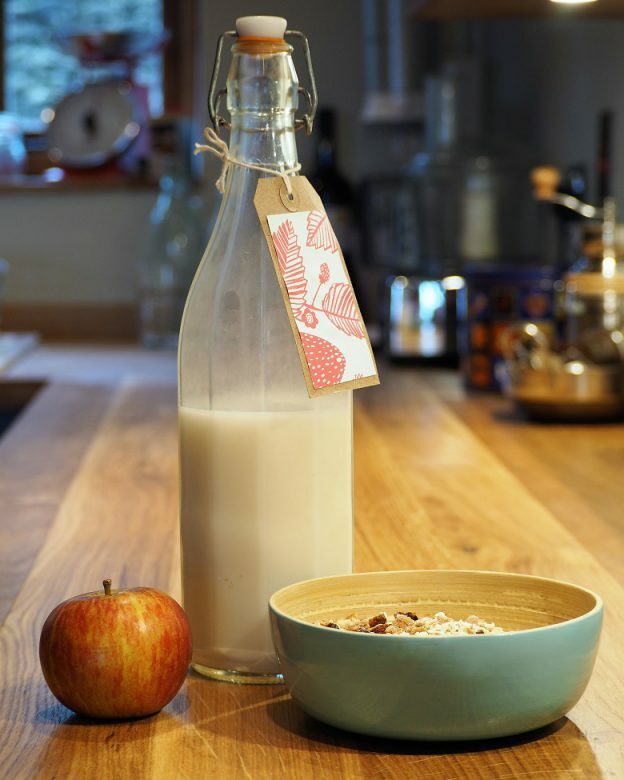 The obvious solution is to make your own nut, oat, rice, hemp or soya milk and until I had a go at this, I had no idea how easy it is. These alternative milks last a few days in the fridge and can be used with breakfast cereals, smoothies, shakes and for cooking with. They do tend to curdle slightly if added cold to a hot drink. You can add vanilla, maple syrup or pitted dates at the blending stage to increase the sweetness, but nut milks tend to be naturally sweet. Many websites also give you recipes for using up the pulp that is left over, for example to make oat biscuits. Oats and rice milk are perhaps the quickest and cheapest options, but you do not need large quantities of the basic ingredients, so price is not really an issue (I am convinced that the cost of the ingredients in commercial products are miniscule compared to the cost of the packaging and transport and mark-up for the retailer). Cashews also lend themselves to making cream which is great to use in Indian cooking. Simply soak a handful of cashews in a cup of water for 10 minutes and then blend – no need to strain afterwards. You will need a blender or food processor, a piece of muslin or cheese cloth, a funnel and glass bottles with lids. If you have a local unpackaged or zero waste food shop, you will be going along with your fabric bags to stock up on the ingredients. If not, it’s time to get searching as most cities have at least one zero-waste, bulk buy, or unpackaged food shop. Have a look here. This entry was posted in Food shopping, In the kitchen, Recipes and tagged almond milk, oat milk, rice milk, tetra pak on March 25, 2018 by admin. I used to have a line-up of Pukka teas all along the top of my kitchen dresser. Attracted by the colourful packaging and enticing names, I believed that these tea bags were plastic-free until a reader pointed out to me that the sachets each tea bag is sealed in is lined with a polymer for gluing the paper together. Many herbal tea brands, if not all, use plastic in some way or another so I decided to look around my garden to see if I had any herbs, apart from the obvious peppermint and lemon balm, that would be good for making herbal tea. I counted 11 additional plants: chamomile, purple and green sage, rosemary, thyme, elderflower, comfrey, yarrow, nettles and dandelion. And that was just the ones I instantly recognised. How had I missed this opportunity for fresh tea straight from mother nature? The answer of course is because of shiny beautiful packaging of ‘bought’ tea and how easy it is to pop a pack into the shopping basket. Fresh herb tea tastes beautifully subtle and alive and is easy to make – simply pour hot water over a few freshly picked leaves and let them steep for five minutes. Drying bunches of herbs for making tea for the winter months is also very easy to do. Hang a bunch of herbs upside down for a few days, rub the leaves or flowers off the stems, and store them in a jar or paper bag. You can combine different herbs to suit your taste or try recipes for soothing colds and other ailments. Another wonderful type of herbal tea is hot water with a shot of homemade elderflower cordial. You don’t need to grow a great quantity of herbs to make a lot of herbal tea – which came as surprise to me. Just one yarrow plant yielded much more than I could possibly use. There are also many wild herbs and weeds that make great tea, such as nettle and dandelion leaves. If you don’t have a garden, growing peppermint in a pot on your windowsill or collecting wild herbs on a walk are good options. You can of course buy loose leaf unpackaged tea from Neil’s Yard and other tea shops – but do take your own paper bags and ask them not to put a plastic sticker on the bag. 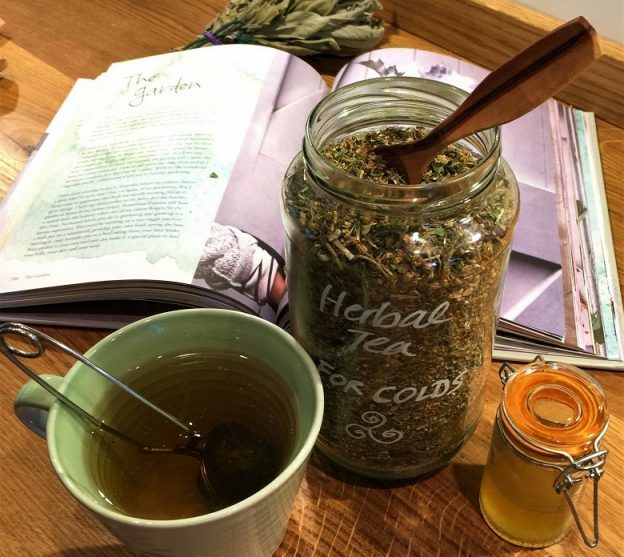 This entry was posted in Health, In the garden, Recipes and tagged herbal tea, loose leaf tea on February 10, 2018 by admin. Since deciding to have a serious look at living without plastic some 18 months ago, we have had to radically change the way we go about shopping. With very few exceptions, we do not buy any single-use plastic. Gone are the days of filling a shopping trolley with whatever we fancy and can afford, or shopping online for convenience. In the beginning I was fascinated and excited by the task of finding alternatives to plastic and I spent a considerable amount of time seeking out unpackaged food and household items made from newly invented and natural materials. I also rediscovered second hand shops and flea markets. But as time went on my enthusiasm waned with the realisation that the issues about waste and pollution are more complicated and that consumption, of whatever kind, always has an environmental impact. So, what is in my bins? Raw and cooked food scraps are in their respective composting bins. Paper, cardboard, glass, batteries, light bulbs, foil and tin are in the recycling boxes. There’s a bag of odds and ends for the charity shops. Items that cannot be reused or recycled are in the trash which is now a fraction of what it used to be. Curiously, now that the non-recyclable waste has shrunk to an amount so small that it doesn’t even warrant a bag, I feel even more responsible for it. I don’t feel good about the recycling box either. I look at the amount of cardboard and glass bottles and it suddenly seems an excessive way to package things that only give a moment of pleasure but demand precious resources, as well as man and machine power. 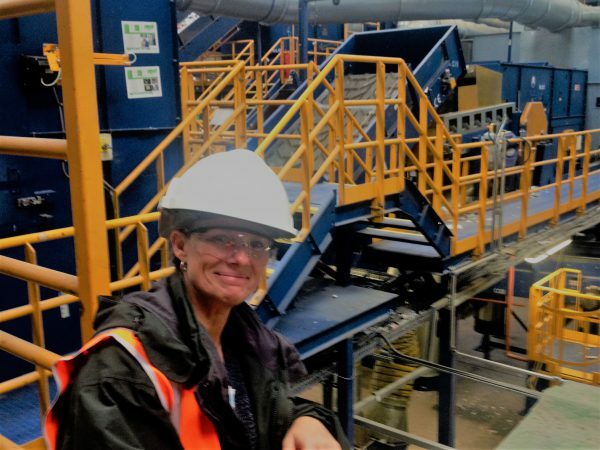 I was interviewed for a recent episode of BBC Radio 4’s Costing the Earth on recycling, called ‘Where does our waste go?’ I joined the team on a tour of a large, modern sorting facility (MRF) in Birmingham that sorts 80,000 tons per year of domestic recycling collected by different Councils. 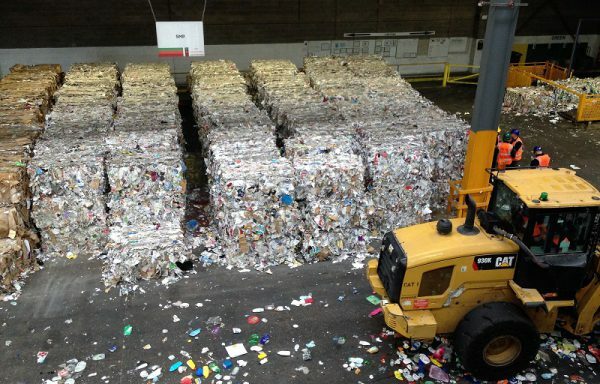 The facility produces bales of different materials to sell on but there still were heaps of unsorted rubbish at the end of the process due to mixed materials and contaminated materials, which is typically shipped abroad. For example, the facility cannot process Tetrapak cartons which are made of paper, plastic and aluminium. 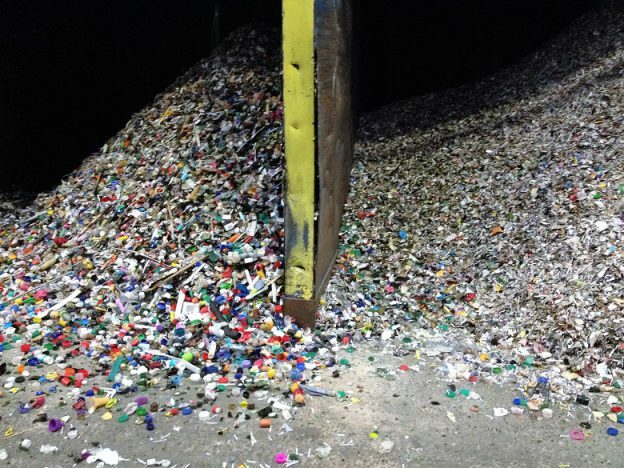 Some of the already sorted piles were so full of small pieces of plastic that the material being sorted was unrecognisable. All I could see in the glass pile was coloured bits of hard plastic such as bottle caps and broken biros, clothes hangers, bits of toys and so on. 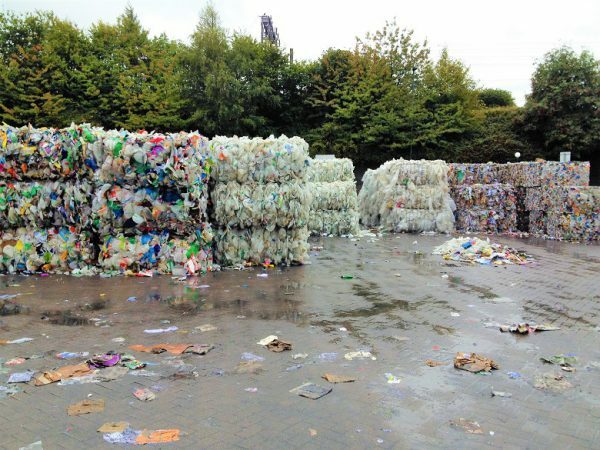 The radio programme was good but narrowly focussed on what is being collected for recycling in the UK without reference to the much larger proportion of waste that is not recycled. In terms of plastic, only 14% of plastic packaging is collected for recycling worldwide. When additional value losses in sorting and reprocessing are factored in, only 5% of material value is retained for a subsequent use (Ellen MacArthur Foundation 2016). We are not coping with the tsunami of waste being created despite recycling efforts and plastic waste is our biggest problem right now. Only last month new reports were published about microplastic particles in drinking water and table salt. Plastic particles are already all around us in rivers, soil, remote arctic ice, deep-sea beds, in the food chain and even in our own bodies. Recycling is often cited as the solution, conveniently making the problem of plastic pollution the responsibility of the ‘consumer’ and tax payer rather than looking at cutting plastic production by commercial industries. 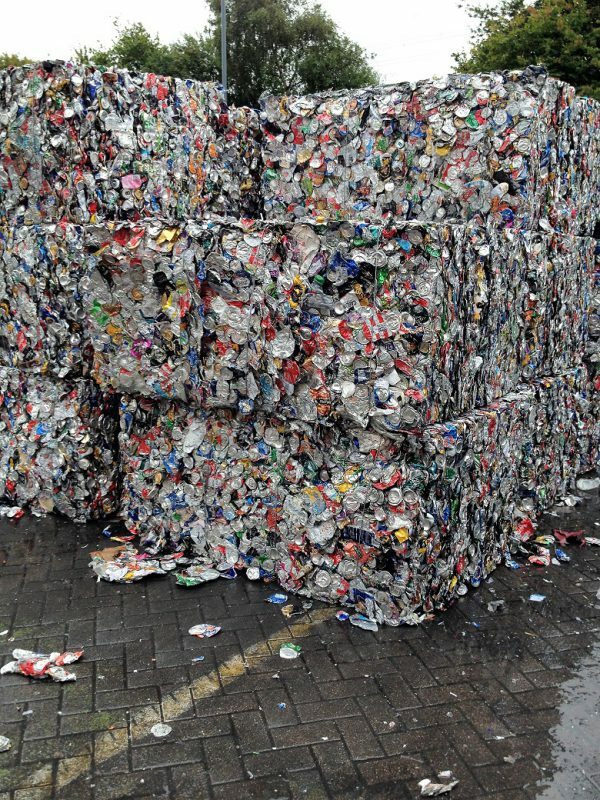 In the UK, recycling collection figures are declining, making recycling even less effective than it already is. If we don’t want to be reduced to simply being consumers, we need to stop behaving as such. We need to learn about the environmental impact of the things we buy not only in terms of waste but also in terms of resources used, production methods and transportation. Cotton and polyester clothing, for example, have a devastating impact on the environment in terms of chemicals and water used during production. Compostable plant-based plastic, hailed as the eco alternative to petroleum-based plastic, competes for arable land and is even causing deforestation to satisfy demand. Lately I have found myself contemplating items before buying them, scrutinizing them carefully, asking myself why I want them in the first place? I wonder where the item was made, what materials were used, how it was transported, how the workers were paid and how the raw material was mined? I often return empty handed from a shopping trip for clothes, shoes and other everyday items. I didn’t need them after all! What has replaced the thrill of buying is the desire to cherish and look after things I already have. I want to have a less cluttered life and surround myself with objects that are unique, beautiful, useful and leave a small footprint. What’s in my bins has made me think about what I most value and what I really need and enjoy. Scrutinize the contents of your bins and let them give you some feedback. The process might lead you to a new and positive relationship with the things you value most in your life. 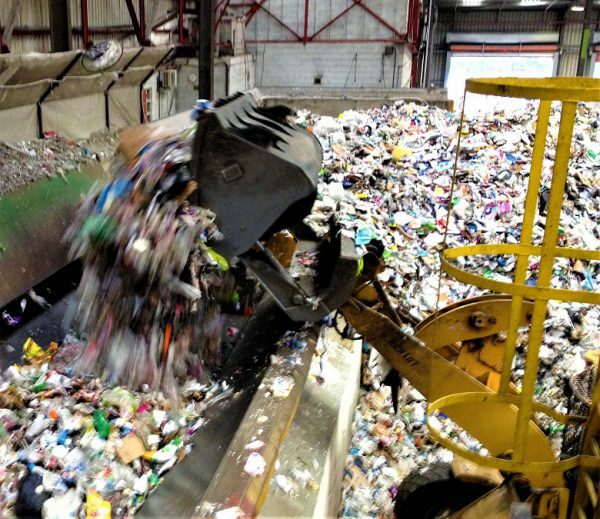 Costing the Earth: Where does our waste go? This entry was posted in General, Recycling and tagged costing the earth, ethical consumerism, plastic production, recycling on October 29, 2017 by admin. The introduction of the 5p charge for plastic shopping bags in 2015 caused a fantastic 84% drop in bags being handed out in UK supermarkets. A much welcomed and decisive step in the right direction. At the same time we have also seen the rise of biodegradable and compostable bags and packaging. But as with many new laws and inventions, there are often unforeseen consequences. Ireland’s tax on plastic shopping bags, and the plastic bag ban across some territories in Australia more recently, resulted in a significant increase in sales of heavier plastic waste bags for kitchen bins. Biodegradable bags are made of a blend of plastic and corn or potato starch and will decompose in water and in CO2 but still cause plastic pollution in the long run. Bioplastic crops needed for this type of bag, and for compostable packaging in general, compete for land with biofuels and food crops, causing big problems such as loss of rainforests in favour of agricultural land use. The dilemma continues when you consider the environmental impact of paper bags and cotton bags in terms of resource use, energy and greenhouse outcomes. According to a UK Environmental Agency report, a paper bag would need to be re-used at least four times and a cotton bag 173 times to have a lower environmental impact than a single-use plastic bag. The simple solution is to avoid single use bags altogether and to have our own supply of cotton bags always at the ready. 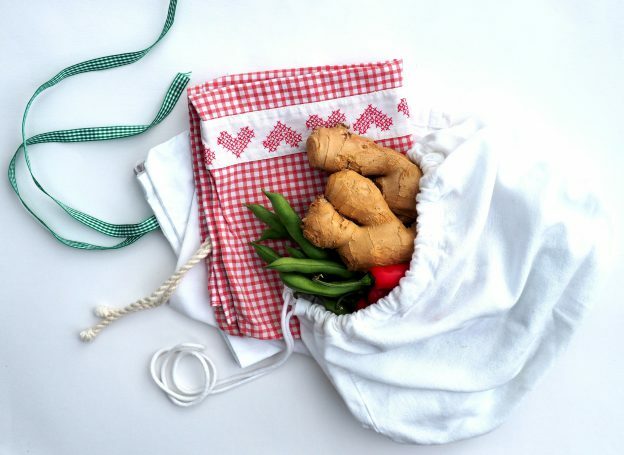 In addition to the usual cotton and hemp carrier bags, we can also have small fabric bags for bagging up fruit, veg, bread and other loose items in the shops. I made a variety of small bags one afternoon from fabric I had saved over time, including my sons’ first cot bedlinen. If you don’t sew, you can buy organic cotton drawstring bags from Etsy or a dozen other online shops. As for kitchen bin bags – since I decided to live without plastic bags altogether we had to be more rigorous about separating compost, cooked food and recyclables so that the kitchen bin can be emptied straight into the large bin outside without the use of a bag. My little shopping bags are precious to me now and I wouldn’t dream of throwing them away or using them as a bin bag. It’s just a small mind shift from ‘throw-away’ to ‘keepsake’ that puts the solution to the big problems into our own hands. This entry was posted in General and tagged biodegradable bags, compostable bags, cotton bags, fabric bags, plastic bag ban, plastic bags, plastic pollution, zero waste on August 25, 2017 by admin.